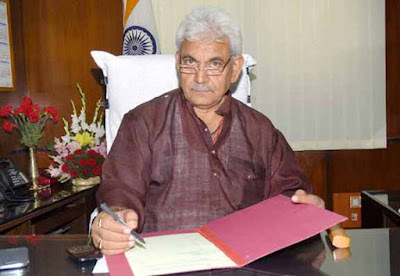 New Delhi : Manoj Sinha, who is the Minister of State for Railways, informed in a written reply to a question in Lok Sabha today, he told that, "there are no plans to privatize the railway services. However, outsourcing of certain facilities like cleaning, pay and use toilets, retiring rooms, parking, ticketing etc. is done on need based manner to improve efficiency." He said, "as per the sectoral guidelines for Domestic/Foreign Direct Investment issued in November, 2014, private participation is permissible in suburban corridor projects through Public Private Partnership (PPP), high speed train projects, dedicated freight lines, rolling stock manufacturing and maintenance facilities, railway electrification, signalling system, freight terminals/logistics parks, passenger terminals, railway technical training institutes, testing facilities, concessioning of standalone passenger corridors, non-conventional sources of energy, mechanized laundry, bio toilets, technological solutions for level crossings and to improve safety. While, he informed that, "A MOU has been signed on 10th April 2015 between the Ministry of Railways and the National Institute of Design (N.I.D. ), Ahmedabad for setting up of a Railway Design Centre at N.I.D. campus, Ahmedabad. The MOU aims at collaboration between Ministry of Railways and N.I.D. in various fields of design, relevant to rail transport and allied activities. Railway Design Centre at N.I.D. has become operational since May 2015.